3D printing is being applied in a world of different ways, but perhaps none more worthy than the Victoria Hand Project. It’s providing low-cost prostheses to people in countries like Cambodia, where landmines have left a horrifying need. Part of British Columbia’s thriving startup scene, Victoria Hand Project won the 2017 Google.org Impact Challenge, Canada, and gained funding to provide 300 hands in seven countries. It has existing clinics in Nepal, Cambodia, Guatemala, Ecuador and Haiti. With the funding, the project added a clinic in Egypt, probably will add one Uganda in the fall and has plans for one in India as well, according to Michael Peirone, chief operating officer. 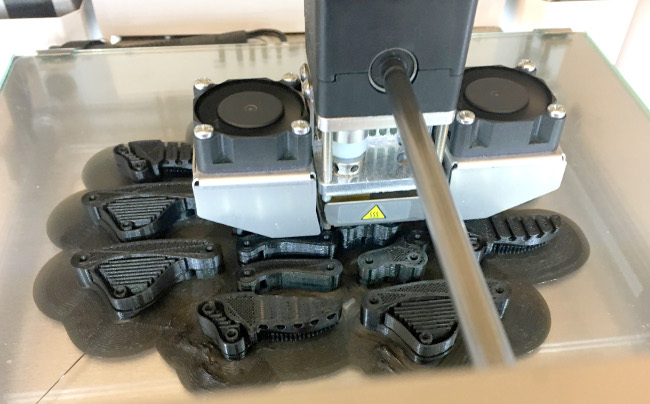 Rather than setting up a manufacturing facility, it sets up clinics, provides the 3D printers and trains locals to produce the hands themselves — how to use the printers, how to assemble the hands and how to use all the software. If a part gets broken, a replacement can be printed quickly and cheaply. The total cost of the hand is US$320, including paying the clinician and technician, who create a custom forearm socket for the patient, and $80 in materials. By contrast, providing a patient just a hook costs $2,000 to $5,000 for materials in North America, he said, and a carbon fiber upper arm with elbow would be around $10,000. The project grew out of the biomedical engineering department of the University of Victoria, where it remains housed. Students such as Nicholas Whtye worked on the latest design, the VC200. University of Victoria professor Nikolai Dechev came up with the original design back in the ‘90s, while a master’s student at the University of Toronto. It used metal fingers, though, and cost $10,000. This design is completely mechanical, rather than using motors or sensors, which would add to the cost. It employs a shoulder harness; by hunching their shoulders, the user can pull the cable and close the hand. The fingers move together, but because of adaptive grasp, they’re semi-independent. The hand enables people to do various tasks, Peirone said. Using a locking mechanism on the fingers, for instance, a person can carry a bag. It’s possible to use it to throw a ball — with practice, he said, though catching is easier. This man is getting to use his right hand for the first time in 30 years, thanks to 3D printing. The project has not written any of its own software, Peirone said, finding existing programs that work well for its needs. “When the project started three years ago there was a lot of research put into finding software that would complete the operations that we needed,” Peirone said. It uses SolidWorks computer-aided design (CAD) software to model every component. It was used to alter Dechev’s metal hand for 3D printing and is used to make custom, equation-based models of the forearm sockets for each patient. “SolidWorks is great for modeling components for machine or cars, but modeling an organic shape is difficult. Then taking that organic shape and making it equation-driven makes it much more complex. The hand also needs to be modeled for an organic shape,” Peirone said. It uses AgiSoft PhotoScan and/or Scan Studio in different countries. These use photogrammetry to create accurate models of the user’s remnant limb. It will capture 80 photos of the remnant limb and in 30 minutes create a computer model of the limb. This process is much less expensive than laser scanning. Scan Studio, used by the Next Engine 3D laser scanner, works well and requires less work to scan, but is too expensive to outfit in every clinic, Peirone said. MeshMixer is used to create the custom forearm socket from the scan data. Different sizes — length, circumference — of sockets are tested to determine which one fits the user’s limb best and will most comfortable. Models from SolidWorks are loaded into the 3D printing software Cura for printing on Ultimaker 3D printers. Cura enables the user to set all of the parameters such as the infill density, wall thickness, print speed and the print layout. The custom socket and prosthetic are printed from a bioplastic called PLA, or polylactic acid. It’s black, but team members have found people in various countries very concerned about the aesthetics of the hand, and many don’t like black, so the hands are painted to a shade patients like better. Everything is 3D printed except bolts and cable, then assembled by technicians. The socket can take eight to 10 hours to print; other components can take 20 hours. The clinics typically can make about two hands a week. The project has partnered with organizations such as the Range of Motion Project in Guatemala and Ecuador and Nepal Orthopaedic Hospital on the venture. The Google money ($250,000) should last three years, Peirone said, but then it will require more funding.